The workshop was conducted in the Advanced Surgery Training Centre, National University Hospital. Surgical techniques and experience were shared in areas of laparoscopic nephrectomy, partial nephrectomy, pyeloplasty, ureterolithotomy and adrenalectomy. This was followed by sessions in the dry and wet laboratory where 30 participants from the region participated in hand-on surgery on animal models. Dr Ho delivered two lectures, sharing his laparoscopic surgical experience in pyeloplasty and ureterolithotomy. 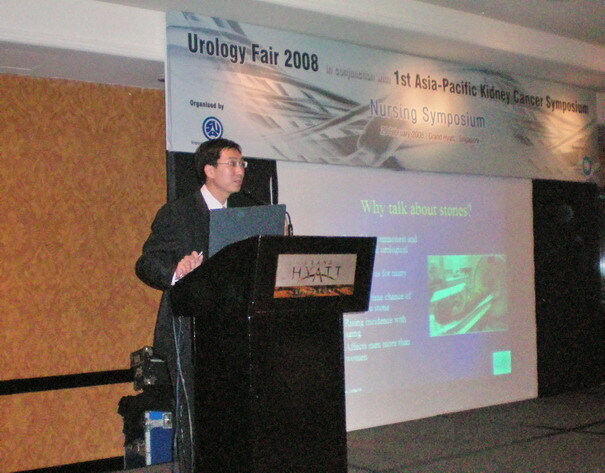 Urology Fair is the Annual Scientific Meeting of the Singapore Urological Association and in 2008, it is held in conjunction with the inaugural Asia Pacific Kidney Cancer Symposium. It attracted urologists, medical oncologists, scientists and nursing personnel from the Asia Pacific region. The main meeting was based around advances in treatment of kidney cancer with numerous hands-on workshop and subspecialty convention. The main meeting focused on the latest in surgical and medical management of kidney cancer. Laparoscopic nephrectomy is the accepted standard of care for small and early kidney cancer and there is a strong tendency towards kidney-sparring surgery for very early kidney cancer. More effective chemotherapy regimes are available for advanced kidney cancer where benefits are observed in longer survival and less side-effects. Newer and 'targeted-therapy' chemotherapy agents are also available in oral (tablet) form instead of injections. Dr Ho chaired two sessions on the management of metastatic kidney cancer and a lively discussion on the treatment of 'challenging' kidney cancers. The first lecture titled 'Algorithm for the Management of Advanced Renal Cell Carcinoma' was delivered by Dr Robert J. Motzer, MD, Memorial Sloan-Kettering Cancer Center, USA. Oral chemotherapy agent such as Sunitinib is recommended as the first-line treatment for both low and high risk metastatic kidney cancer. Temsirolimus, which is delivered intravenously, has similar results in high risk metastatic disease. Sorafenid, which is also an oral preparation is an alternative to both low and high risk diseases. Several 'challenging' kidney cancer cases were put-up for discussion by an international panel comprising of Dr Motzer (USA), medical oncologist; Dr Lau (Australia), urologist; Dr Hong (Singapore) medical oncologist and Dr Wood (USA), urologist. The nursing symposium held in Grand Hyatt Hotel was well attended by over 200 nurses and para clinical personnel from Asia Pacific. Dr Ho delivered a lecture on 'Current trends in urinary stone management'. Urinary stones have troubled man since medieval times and surgery for bladder stones have been done since the 14th century. The current trend is moving towards minimally invasive treatment such as shock wave treatment (lithotripsy), endoscopy with laser and percutaneous surgery (needle hole). Such techniques can treat upto 99% of all patients with stone without the need for open surgery.